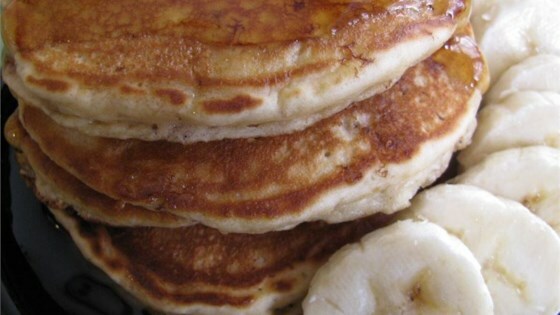 "I have a common pancake recipe that I modify from time to time. This one tastes fantastic with warm maple or strawberry syrup. I freeze leftover pancakes and reheat in the toaster, spreading them with strawberry or raspberry jam. Yum!" Whisk flour, baking powder, sugar, and salt together in a mixing bowl. Combine milk, banana, peanut butter, egg, canola oil, and vanilla extract in a separate bowl; pour into the flour mixture and whisk together until thoroughly mixed. Ladle batter in 1/4 cup portions onto hot griddle. Cook until tiny air bubbles form on top, 2 to 5 minutes; flip and continue cooking until the bottoms are browned, 2 to 3 minutes. Repeat with remaining batter. Keep finished pancakes warm. It's a good basic recipe; however, please note that there is far too much baking soda called for in this recipe. 2 tablespoons should most likely be two teaspoons. I really enjoyed these pancakes. They were very fluffy and full of flavor. I added some chocolate chips to some of these and they were amazing! Great recipe! Very fluffy and good flavors. I halved th recipe and it was enough for me, my husband, and 4 year old. Everyone liked it! My son found this recipe and has used it a couple of times now. The pancakes are very rich and have a wonderful flavor. Our whole family enjoys them!